" D I S C O V E R T H E W O R L D ! " Are you interested in joining the camp, or want more information? Contact us! Netherlands. The camp will be held at Tuikwerderrak, a large park in the middle of Delfzijl. About 300 scouts from the age of 7 and older, coming from several European countries, will be exploring and adventuring in and around the city for ten days. The International scout camp is held every three years, alternating between the participating countries. 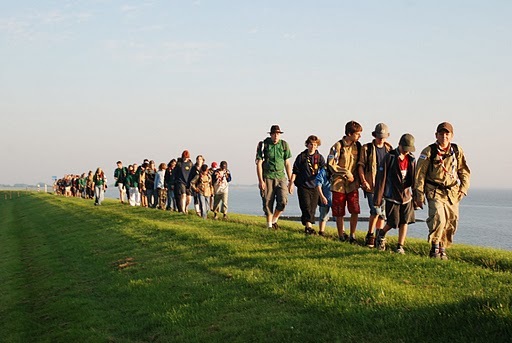 Scouting Delfzijl has been joining those camps for almost four decades. Together with our group, several Swiss and Danish groups are recurring participants to the camp. Besides the recurring participants, the organization of the camp is searching for more groups to join. If you are interested in joining the camp, please let us know! As of today, the English version of our website has launched! We are hoping to support more languages in the future, but in the meantime, perhaps you could try using google translate if you want to read in your own language.